At Abbey Gates we specialize in the manufacture and installation of Metal Railings & Fencing for residential and commercial purposes. We are able to manufacture a diverse range of bespoke wrought iron railings or fences to fit our customer’s exact requirements. To get your new metal railings and fencing all you need to do is pick up the phone and call, email us, or contact us using the form to the right of this page. Even if you are just looking for a general metal railings & fencing quote or have any other questions regarding lay-out or design, we are open 24 hours a day plus weekends to answer any question you might have. If you want the exact cost of new metal railings or fencing, we are happy to come out for a free, no-obligation visit to measure your garden or properties perimeter. During our visit we can also show you our catalog and discuss any bespoke qualities you want for your metal railings or fencing. We can arrange this call out at your leisure and after you know everything you need to, all that’s left to do is for you to tell us your choices. 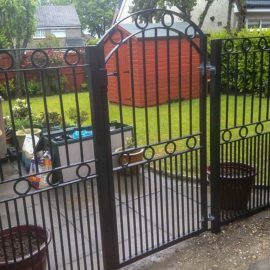 Abbey Gates use only the best materials combined with expert craftsmanship when making our metal railings & fencing to ensure they are durable, stylish and work for their best purpose, security. We use ‘wrought iron’, which is an iron alloy with very low carbon content. It is very strong but malleable, that is why it is used in some of the best structures in the world, including the Eiffel tower. What style of metal railings or fencing should I get? 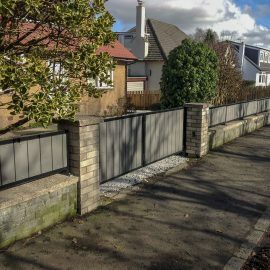 Metal railings & fencing come in all shapes, sizes and colours and by just a quick look at your house you can determine a rough idea of what kind of railing or fence style you are looking for. If you have a modern house, you could possible choose a simplistic style which will compliment your house. For a historic looking house, you may want a Victorian style with the use of spires or finials attached. Next you will want to have an idea of the security you need. For instance, do you require tall metal railings or fencing to further discourage entry to your property by strangers. For more information on gate styles, please visit our gallery for metal railings and fencing styles. We can also show you our catalog during our free call-out. What do we do to make your metal railings or fencing? We firstly make a plan of the area using the measurements we obtained at the call-out. We design the railings or fence according to your specifications, we then manufacture them in our work-shop and paint it with whatever colour and finish you want. We then install it after leveling the ground to allow the gate to swing freely and then we dig the holes for the metal posts and insert them securely in the ground. How will my railings or fence be protected from weathering? The railings/fencing can be protected from weathering & accidental damage by galvanizing the metal surface. Galvanizing is the process in which wrought iron or steel is placed in a thin layer of zinc at a temperature of 460°C. In this atmosphere, the zinc reacts with the oxygen to form ‘zinc oxide’. After this, another reaction occurs with ‘carbon dioxide’ to form, zinc carbonate. 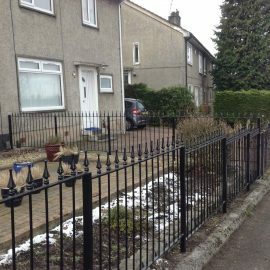 If you already have metals gates and railings, but wish to refurbish or replace them, we can also achieve this for you. Metal can be protected from the elements with the use of galvanizing. Corrosion can occur from harsh weather, freezing and thawing throughout winter months and acidic rain. If a metal is corroded, further rusting can only occur as well as accidental damage. 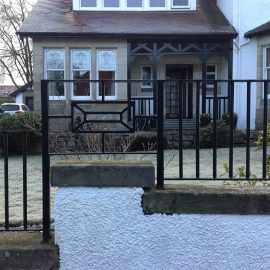 What are the benefits of having a metal railings or fencing?